Members of Cal Lutheran's Military Veterans Club. THOUSAND OAKS, CA - California Lutheran University is hosting a Veterans Day Celebration featuring music and a barbecue dinner from 5 to 6:30 p.m. Saturday, Nov. 8. Admission to the tailgate party is free for veterans and military members and up to three guests for each with proof of service. They can bring additional guests for $10 each. Country rock cover band Highway Starr will perform at the celebration, which will be held on the presidential patio outside the Pederson Administration Building on the Thousand Oaks campus. Gift baskets will be raffled off to support Cal Lutheran’s Military Veterans Club. After dinner, guests can watch the Kingsmen football team play Occidental College at 7 p.m. in William Rolland Stadium. Admission is free to all. Before the tailgate party, visitors can watch a short documentary about the healing effect that therapeutic horseback riding had on a veteran with post-traumatic stress disorder. The award-winning “Riding My Way Back” will be shown at 4:30 p.m. in Alumni Hall 128. Staff members from Newbury Park-based Ride On Therapeutic Horsemanship will answer questions after the film. Cal Lutheran is ranked third among regional universities in the West in the Best Colleges for Veterans list. The university works with the government to cover all tuition and fees for an unlimited number of qualified undergraduate and graduate students through the Post-9/11 GI Bill and Yellow Ribbon Program. 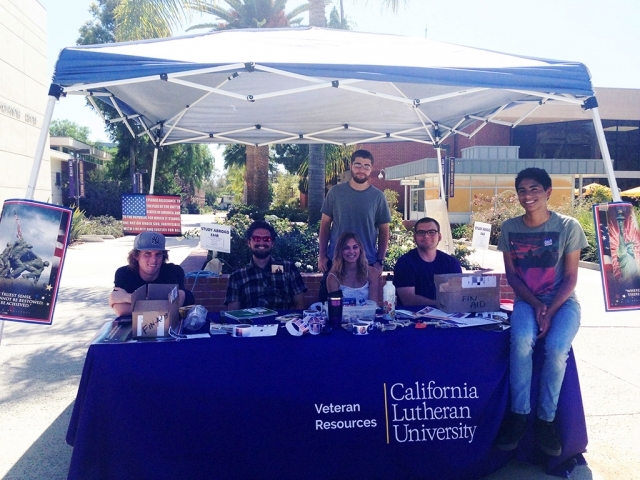 Cal Lutheran also belongs to the Servicemembers Opportunity Colleges Consortium and has a veterans coordinator who organizes events and helps with enrollment, financial aid and academic issues. Pederson Administration Building is located at the southwest corner of Olsen Road and Mountclef Boulevard. William Rolland Stadium is on the north side of Olsen Road between Campus Drive and Mountclef. Alumni Hall is west of Mountclef between Olsen and Memorial Parkway. To RSVP for the celebration, go to CalLutheran.edu/veterans. For more information, contact Veterans Coordinator Jenn Zimmerman at 493-3648 or veterans@callutheran.edu. Sacramento – The California Department of Veterans Affairs (CalVet) is pleased to announce our recently revamped website received a Digital Government Achievement Award from the Center for Digital Government. The annual awards recognize outstanding city, county, state, Federal, and international government websites and digital projects. Launched in March, 2014, our new website offers detailed information about Federal and state benefits and location-specific local services available to our Veterans and their families, including eligibility requirements and how to apply. Our site enables CalVet to leverage technology as a more cost-effective means to reach the growing number of California Veterans. Our site also provides CalVet the opportunity to merge existing databases and provides a platform for information exchange with other Federal and state agencies. Our myCalVet tool is one of many CalVet efforts to increase the number of California Veterans and family members connected to the benefits they earned through their military service. To view the full list of Digital Government Achievement Awards recipients, go to http://bit.ly/1qhvSd1. To visit the CalVet web site and create your own myCalVet profile, go to www.calvet.ca.gov. Sacramento – Veterans, active duty service members, and their families received needed legislative support thanks to several bills signed by Governor Edmund G. Brown Jr.
“By signing these important bills into law, the Governor once again demonstrates his unwavering commitment to our California Veterans, service members, and their families,” said Peter J. Gravett, Secretary, California Department of Veterans Affairs (CalVet). The package of 19 bills includes legislation allowing Veterans to receive special designation on their driver’s licenses (AB 935); provides spouses of military personnel who are licensed in another state to receive a 12-month temporary license to practice their profession in California (AB 186); directs CalVet to develop a California-specific transition assistance program for Veterans leaving the military (AB1509); provides greater oversight of private for-profit colleges and universities (AB 2099); and exempts a Veteran from any state from paying out-of-state tuition at California community colleges, California State Universities or University of California Campuses (AB13). •	AB 935 by Assemblymember Jim L. Frazier Jr. (D-Oakley): Allows Veterans to apply for a driver's license or identification card that includes a special “Veteran” designation. •	AB 186 by Assemblymember Brian Maienschein (R-San Diego): Requires Department of Consumer Affairs licensing entities to provide military spouses and domestic partners licensed in another state with a 12-month temporary license to practice their profession in California if they meet certain conditions. •	AB 1509 by Assemblymember Steve Fox (D-Palmdale): Requires CalVet to develop a transition assistance program for Veterans who have been discharged from the U.S. Armed Forces or the National Guard of any state. •	AB 2099 by Assemblymember Jim L. Frazier Jr. (D-Oakley) – Provides the California State Approving Agency for Veteran Education (CSAAVE) with greater authority over for-profit colleges and schools that serve Veterans using their GI Bill education benefits. •	AB 13 by Assemblymember Connie Conway (R-Tulare): Requires the California Community Colleges and the California State University to update in-state tuition rate policies for eligible Veterans to ensure compliance with the Federal Veterans Access, Choice, and Accountability Act of 2014 and it requests the Board of Regents for the University of California to do the same thing. •	AB 585 by Assemblymember Steve Fox (D-Palmdale): Requires the California Department of Veterans Affairs (CalVet) to develop a prioritized list of uses for unused or underutilized nonresidential real property it owns. •	AB 614 by Assemblymember Rocky Chávez (R-Oceanside): Ensures that a Veteran with 70 percent or more service-connected disability receiving intermediate care or skilled nursing care in a Veterans home shall have their account deemed paid in full by the amounts paid on their behalf by the U.S. Department of Veterans Affairs. •	AB 919 by Assemblymember Das G. Williams (D-Santa Barbara): Permits Veterans who are itinerant vendors to receive a refund of sales taxes paid to the Board of Equalization between April 1, 2002 and April 1, 2010. •	AB 1397 by the Committee on Veterans Affairs: Requires the California Department of Human Resources to collect and report on data regarding the Veterans preference system in state hiring. •	AB 1453 by Assemblymember Sharon Quirk-Silva (D-Fullerton): Requires CalVet to cooperate with local government bodies in Orange County to design, construct and equip a state-owned and operated Southern California Veterans Cemetery in the City of Irvine and establishes eligibility for interment. •	AB 1589 by Assemblymember Jim L. Frazier Jr. (D-Oakley): Requires an elections official to arrange electronic delivery of a ballot to a military or overseas voter who makes a standing request for all elections, eliminating the requirement that the individuals renew their email address every two years. •	AB 1821 by Assemblymember Richard S. Gordon (D-Menlo Park): Establishes the Medical Foster Home Pilot Program and authorizes U.S. Department of Veterans Affairs facilities to create a medical foster home not subject to licensure or regulation as a residential care facility for the elderly. •	AB 2215 by Assemblymember Brian Maienschein (R-San Diego): Allows a Veteran’s family or legal representatives to file a copy of a Veteran’s military discharge document with a county recorder without the consent of the Veteran. •	AB 2263 by Assemblymember Steven Bradford (D-Gardena): Authorizes a Veterans service organization to volunteer as a Veterans service advocate at California Department of Corrections and Rehabilitation facilities. •	SB 842 by Senator Stephen T. Knight (R-Palmdale): Requires the California Department of Transportation to construct directional signs on state highways for each Veterans home in the state. •	SB 1110 by Senator Hannah-Beth Jackson (D-Santa Barbara): Requires the court to inform active duty or Veteran status defendants of restorative relief rights available to them and requires the Judicial Council to include information about the provisions in its military service form. •	SB 1113 by Senator Stephen T. Knight (R-Palmdale): Extends the statute of limitations for a Veteran with a 100 percent service-connected disability to claim a disabled Veteran property tax exemption refund from four to eight years. •	SB 1226 by Senator Lou Correa (D-Santa Ana): Expedites the Department of Consumer Affairs boards’ and bureaus’ initial licensure process for Veteran applicants who were active duty and stationed in California and authorizes prospective proprietary private security officers to submit verification of military training in lieu of a course in security officer skills. •	SB 1227 by Senator Loni Hancock (D-Berkeley): Authorizes a court to create a diversion program for active duty military personnel or Veterans who commit misdemeanors and who are suffering from service-related trauma or substance abuse. Ventura County veterans and military personnel with legal questions will have a new way to get answers starting in mid-October when the Ventura County Military Collaborative’s legal clinic opens. During twice a month clinics, the Military and Veterans Legal Clinic Ventura County will provide veterans and active duty, guard and reserve with a free one-hour consultation with a licensed attorney. Family members and dependents cannot be seen at this time. Among the topics covered: DUIs; child custody, child support, divorce, family law matters; credit or bankruptcy; landlord/tenant disputes; estate planning; powers of attorney; expungement; workers’ compensation; and unemployment benefits. Kim Evans Logie, director of the Ventura County Military Collaborative (VCMilC), spearheaded formation of the clinic. Her time as Director of Psychological Health with the 146th Airlift Wing, work with the CA Army National Guard and her current position as liaison to the Veterans Treatment Court convinced her of the need for free legal services for veterans, active duty, guard and reservists. The clinic will meet once each month from 1 p.m. to 5 p.m. on a Friday and on the following Saturday from 9 a.m. to 1 p.m. Appointments are available now for the first five meetings: Fridays, October 17, November 14 and December 12; and Saturdays, October 18 and November 15. Go to www.military411.org to sign-up. Walk-ins will be accepted on a first-come, first-served basis, if an attorney is available. Clinics will be held at the Ventura County Community Foundation Building at 4001 Mission Oaks Boulevard in Camarillo.Gold Coast Veterans Foundation is graciously supplying the space for the clinic. The clinic has no funding, and is operating with a volunteer corps of local attorneys assisted by law students and community support. Among the supporting agencies are: the Ventura County Bar Association, the Veterans Treatment Court, the Public Defenders Office, RSVP Oxnard, the Ventura County Veterans Services Office, and the Ventura Center for Dispute Settlement. VCMilCconsists of over 120 local, state and federal agencies serving Ventura County military, veterans and their families. 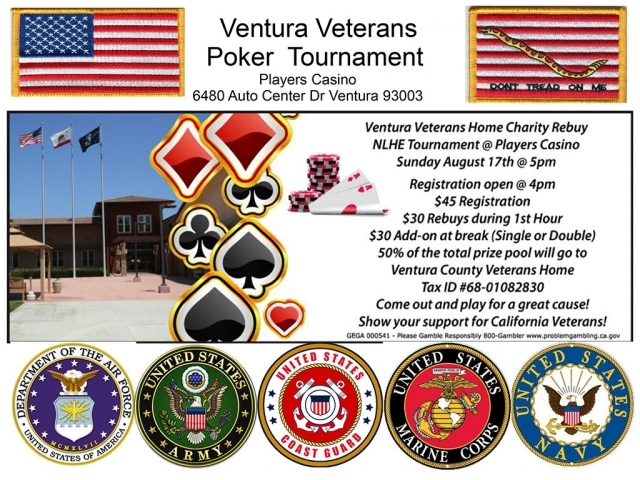 It provides a format for information to be shared, awareness to be raised, community outreach to be strengthened and partnerships to be established with the overall goal to improve services to the military community of Ventura County. Annual events include the Military and Veteran Expo, providing ready access to military-serving agencies, and Operation Snowflake, providing toys to military and veteran families in need during the holidays. VCMilC also provides individual support on a case-by-case basis. Its 501(c)(3) status is pending. WASHINGTON – Naval Mobile Construction Battalion (NMCB) 25 was awarded the Reserve Forces Policy Board (RFPB) Fellows Society’s 2014 Citizen Patriot Unit Award during a luncheon at the Army-Navy Club in Arlington, Va., Sept. 10. The Citizen Patriot Unit Award recognizes units and individuals who have made a substantial contribution to the security of the U.S. and have demonstrated a quantifiable and recognizable pattern of excellence. It is the highest award given by the RFPB Fellows Society and was established in 2002 to commemorate the 50th anniversary of the RFPB. Since 2002, only one other naval unit has earned the award. Known by its moniker “Spades and Clubs,” NMCB 25 is deployed as the Naval Construction Force in support of the International Security Assistance Force (ISAF) NATO Coalition and Special Operations Forces for Operation Enduring Freedom within U.S. Central Command’s area of responsibility. Partnered with the Government of the Islamic Republic of Afghanistan, they are tasked to execute the Train, Advise and Assist (TAA) mentoring mission for the Afghan National Engineer Brigade (NEB) and its two supporting battalions, the Special Engineer Kandak (SEK) and Construction Engineer Kandak (CnEK), in addition to limited construction and deconstruction support to U.S. Forces Afghanistan (USFOR-A). Donahue explained the unique nature of the TAA mission which encompasses all aspects of unit management from administration, intelligence, operations, logistics, communication, safety and command leadership. The intent is to make them more capable and self-sufficient upon the departure of the coalition forces. Retired Army Maj. Gen. Paul Bergson spoke about the caliber of the competitors for the award. “We had 15 or 16 unit nominees this year and they’ve all performed magnificently. The awards committee was looking for a unit that had a long history of service to the country, that’s what NMCB 25 had,” said Bergson. According to the award summary, the 25th Naval Construction Battalion (NCB) was commissioned in September 1942, at Camp Bradford, Va., and underwent its first training at Camp Allen, Va. Shortly after commissioning, the battalion received orders attaching it to the Marine Corps. The battalion transferred to Camp Elliot in San Diego, becoming the 3rd Battalion, 19th Marines, 3rd Marine Division, Fleet Marine Forces. The battalion detached from the Marine Corps in August 1945, and was once again the 25th NCB. The battalion’s operations on Bougainville Island in the South Pacific were under the control of U.S. Army Gen. Douglas Macarthur, giving the 25th the distinction of serving under the Army, Navy and Marine Corps. The 25th NCB built a hospital on American Samoa, an airfield on Guadalcanal and roads and bridges on Bougainville Island. During operations on Guam, the 25th NCB worked long hours and stood night duty to form a secondary line of defense as the Japanese threatened a break through. One enlisted man was awarded the Silver Star for actions against the Japanese. Nineteen officers and enlisted were awarded the Bronze Star for their actions. Upon returning to the U.S. in June 1945, the 25th was officially deactivated in November. The reserve NMCB 25 was commissioned in October 1961 as a member of the Seabee Ready Reserve. The newly formed battalion mustered for the first time at Davisville, R.I.
Today, NMCB 25 is headquartered at Ft. McCoy, a reserve army base located in Wisconsin. Upon redeployment, the unit will relocate to Naval Base Ventura County, Port Hueneme, California. “Many of the men and women of NMCB 25 have answered the call to country many times before; and this award is a testament to the sacrifices they make for their family and civilian careers to become a citizen soldier once again,” said Donahue. More than half of the deployed personnel are from other battalions and non-NCF units who volunteered to mobilize with NMCB 25 and serve in the last battalion in Afghanistan, according to Donahue. VA Vet Centers throughout the greater Los Angeles area will be hosting remembrance ceremonies and open houses on September 11, 2014. This event honors and remembers those who have given the ultimate sacrifice for our nation, not only on this tragic date 13 years ago, but also for the military members and their families who have served in the past and present to keep our nation safe. After a short ceremony, each Vet Center will conduct an open house showcasing many resources with information for Veterans and their families. This event is open to the public. CAMARILLO, CA - Saturday afternoon, Aug. 23, 10 percent of the profits at the Tommy Bahama Outlet in the Camarillo Premium Outlets will be donated to the Ventura County Veterans Fund at the Ventura County Community Foundation. The fundraiser will be from 1 to 6 p.m. at the store, 610 Ventura Blvd., Suite 1340, Camarillo. Live music and refreshments will be offered. The Ventura County Veterans Fund, established on Veterans Day 2010, helps provide employment assistance, counseling, education and housing to veterans returning from the wars in the Middle East through annual grants to nonprofits dedicated to assisting veterans. For more information, contact LaToya Ford at lford@vccf.org, 805.253.7380; or phone the Tommy Bahama Outlet at 805.482.8868. Sacramento - The California Department of Veterans Affairs (CalVet) launched “The Dress Code” clothing drive supporting our Women Veterans as they transition from the military into civilian careers. The CalVet clothing drive takes place until August 15, 2014. Donations of clean suits, blouses, pants, skirts, shoes, handbags and jewelry will be accepted at drop-off locations statewide: www.calvet.ca.gov/womenvets. Donated items are available to attendees at the 7th annual Summit on Women Veterans, titled “Bridging Gaps, Breaking Barriers,” at the Sacramento Sheraton Grand Hotel, August 24 – 25, 2014. Our CalVet Summit also features dynamic speakers and several important workshops for our California Women Veterans. This year’s topics include educational benefits, financial literacy, and starting a business. Attendees will also hear from employers from a variety of companies and industries who will share tips and answer questions about getting hired. The 2014 Summit on Women Veterans is open to the public, and will be held at the Sheraton Grand Hotel, located at 1230 J Street, Sacramento from 10AM August 24 to 5:30PM August 25. Check-in opens at 9AM on August 24. To pre-register for the Summit, go to www.calvet.ca.gov/womenvets or call (916) 503-8334 for more information. CAMARILLO, CA - The Ventura County Veterans Fund at the Ventura County Community Foundation will award $100,200 in grants to local nonprofits that help veterans adjust to civilian life. The awards will be presented at a public reception from 5 to 7 p.m. July 31 to seven nonprofits that meet a variety of veterans' needs, including college and career preparation and emotional therapy. "Because these organizations are local they better understand the challenges our veterans face, and their services will yield even improved outcomes and opportunities for the returning warriors they serve," said Hugh Ralston, VCCF president & CEO. •	$5,000 to Healing in America for the Healing the Returning Warriors program, providing individual energy healing sessions for veterans and their families. •	$20,000 to Turning Point Foundation for the H2H Housing First Veterans Project, to move chronically homeless mentally ill veterans from the streets into permanent housing, and support them where they live. •	$25,000 to Reins of H.O.P.E. for the H.O.P.E for Warriors Ventura County Veterans Services Program, providing confidential equine-assisted psychotherapy and learning sessions for veterans and their families. •	$10,000 to Oxnard College for counseling students through the "Boots to Books" program, offering support to veterans who are transitioning from the military to civilian careers, as well as their dependents. •	$25,200 to the CSUCI Foundation for the Veterans Affairs Internship Program, to offer paid internships to student veterans in their chosen field to provide critical job skills. Representatives of each organization will give a brief presentation ontheir programs and introduce a veteran who has benefitted from their services. The reception will take place at the VCCF Nonprofit Center, 4001 Mission Oaks Blvd., Camarillo. Admission is free but guests must RSVP by contacting Steve Guetzoian at sguetzoian@vccf.org or 805.330.6970. VCCF invests the charitable capital that drives the philanthropic engines of Ventura County. Its portfolio performance ranks in the top 11 of all community foundations in the United States for long-term growth. With total assets of more than $135 million, as of March 30, its mission is to promote and enable philanthropy to improve our community for good for ever, which it does through grantmaking, scholarships and training at its Center for Nonprofit Leadership. It owns the VCCF Nonprofit Center in Camarillo ---- a place where nonprofits and the community can come together to work together. Visit vccf.org or call 805.988.0196. Sacramento, CA – Among tall trees and nestled on a pillar stands El Soldado or as it has more recently been called, the Mexican American Veterans Memorial. This monument to the gallant and patriotic military service of Latino/Hispanic veterans is well on its way to receiving a much needed facelift thanks to the commitment from individuals and organizations alike. The Wells Fargo Foundation is the latest such organization to demonstrate its commitment, not just to veterans and their families, but also to the monuments that showcase their patriotic service. California is home to approximately 1.8 million veterans of which nearly 272,000 are Hispanic/Latino. El Soldado/the Mexican American Veterans Memorial serves as a testament to the service and contributions of these Hispanic/Latino veterans. This Memorial is the only monument nationally recognizing the military contributions of Latino veterans from all branches of the military to be located on state capitol grounds. The Mexican American Beautification and Enhancement Committee and the California Department of Veterans Affairs (CalVet) are diligently working to raise $800,000 to complete the renovations needed by El Soldado. The Memorial Committee and CalVet have established a plan that would fund and construct the enhancements in three stages at the following levels, respectively: $300,000, $500,000, and $800,000. According to their input, each stage would look like a completed memorial, but each new stage would add significant enhancements to the design or landscaping of the prior stage. Shortly after the World War II armistice, a group of Mexican-American women, also known as the "Madres," banded together to create a memorial that would honor their husbands and sons who had died during their military service during the war. Beginning in 1948, the Madres launched a fundraising drive to finance the memorial. Their efforts included selling homemade tamales and conducting raffle sales at their local church parishes and other venues. Dedicated in May 1951, the memorial consisted of a statue of a solitary infantryman. Known as “El Soldado,” the statue stood on the grounds of the Mexican American Center in Sacramento. Weathered and worn over time, El Soldado remained at this site for decades until the location was rezoned by local government. The statue was donated to the State of California with the expectation that it would become an official and permanent state memorial. In 1975, El Soldado was moved to its present location across the street from the Main (West) entrance to the State Capitol. Veterans and their families are encouraged to visit CalVet information tables to learn about the state and federal veteran benefits they have earned through military service. Those benefits can increase family income, pay for college or other types of training, provide health care, home loan financing, residential care for older and disabled veterans and much more! More than 20 other government agencies and veteran service organizations will be at the Fair to offer information as well. CalVet and the California Department of Human Resources will teach veterans how to transition from military service to state service during a “How to Get a State Job” workshop on the Golden 1 Stage at 11 a.m. and 1:00 p.m. Additional information and personal assistance will be available at the CalVet information table. CalVet will also host an MRE (meals ready to eat) Cooking Challenge featuring chefs from The Foundation, Blackbird Kitchen, Hook and Ladder, Rubicon Brewing, Papa Dale’s Mobile Diner and New Moon River Inn Café. Using randomly-selected military field rations and other simple ingredients provided, chefs will have just 30 minutes to create a culinary masterpiece. Members of the California National Guard will judge the dishes created. Winners will receive State Fair ribbons and bragging rights. The CalVet MRE Cooking Challenge will take place at 11:30 a.m., 1:30 p.m. and 7:00 p.m. in the California Kitchen (Building B). The CalVet information tables will be located near the Main Gate entrance all day. For more information about the California State Fair, go to http://www.castatefair.org/. The California Department of Housing and Community Development (HCD), California Housing Finance Agency and California Department of Veterans Affairs are pleased to announce the release of the draft Program Framework (Framework) of the Veterans Housing and Homeless Prevention (VHHP) Program for public review and comment. The purpose of the draft Framework is to provide preliminary thoughts on the VHHP Program design and to solicit public comment as the agencies move forward in the development of full program guidelines. The draft Framework will be used to solicit verbal comments from attendees at the six scheduled stakeholder meetings beginning on July 10, 2014, in Oakland. The draft Framework is available on HCD’s VHHP Program website: http://www.hcd.ca.gov/fa/vets/. Additional stakeholder meeting dates and locations can be viewed on that page as well. Please note, the draft Framework highlights specific questions on which the agencies would appreciate comments/feedback. These questions are identified throughout the document in bolded italics. Interested parties may also submit written comments directly to hcdvets@hcd.ca.gov. Public comments will be accepted through July 23, 2014. ** Please note – The VHHP Program does not provide funding directly to individuals. If you are a veteran in need of assistance please contact the U.S. Department of Veteran Affairs’ Nation Call Center for Homeless Veterans Hotline at 1-877-4AID VET (1-877-424-3838) or visit the California Department of Veterans Affairs’ website at www.calvet.ca.gov. Sacramento, CA – On any given night roughly 16,000 veterans in California have no place to call home; they sleep in parks, under bridges, in their cars, in emergency shelters or on a friend’s couch. Now, thanks to the voters’ approval of Proposition 41 and the partnership of three state agencies, more veterans will have access to permanent, safe and affordable housing. The California Department of Veterans Affairs (CalVet), the California Department of Housing and Community Development (HCD) and the California Housing Finance Agency (CalHFA) also announced today three stakeholder meetings to be held in July around the state to help inform implementation of the Veterans Housing and Homeless Prevention Program. The Veterans Housing and Homeless Prevention Program, created when Governor Brown signed AB 639 by Assembly Speaker Emeritus John Perez in 2013, is already in the development stages and the passage of Proposition 41 will provide the funding to begin helping homeless veterans in California. The ballot measure, overwhelmingly approved by voters on June 3, authorizes the issuance of $600 million in General Obligation Bonds to fund the acquisition, construction and rehabilitation of multifamily low-income permanent and supportive housing for homeless and low-income veterans and their families. CalVet, the HCD, and the CalHFA, are already working to identify the range of needs, and most importantly, potential solutions that will help make a difference in the lives of homeless veterans and significantly improve the housing options for these men and women in California. Stakeholder meetings have been scheduled across the state to gather input on targeting services and identifying where the demand is greatest for the Veterans Housing and Homeless Prevention Program. As program details are developed, information will be continuously updated on a special page of the HCD website, www.hcd.ca.gov/fa/vets/ and on the CalVet website (www.CalVet.ca.gov) . More information can also be obtained by emailing PAO@calvet.ca.gov or hcdvets@hcd.ca.gov. This program administered by the California Department of Veterans Affairs, the Department of Housing and Community Development and the California Housing Finance Agency is dedicated to the preservation and expansion of safe and affordable housing so more California Veterans and their families have a place to call home. The team works to ensure an adequate supply of housing options are available for our veterans and promotes the growth of strong communities. For more information, please visit http://www.hcd.ca.gov/fa/vets/. PORT HUENEME, CA - The U.S. Navy Seabee Museum will open two new galleries covering Seabee training and operations in the Atlantic Theater of World War II in honor of the 70th anniversary of the D-Day invasion of Normandy, June 6, 1944. “From Civilian to Seabee: Seabee Training During World War II “ allows visitors to learn about the U.S. Navy’s hastily established training camps on the East and West coasts trained tens of thousands of men, creating the construction battalions destined for advance bases overseas. In the transformation from civilian to Seabee, visitors discover the origins of the world famous Seabee logo and learn about the weapons, technical training, and organization of the various Seabee units that served in the war. Then, just like those newly trained Seabees, visitors will get the chance to enter “Seabees in the Atlantic Theater in World War II.” Inside the massive bow doors of a Landing Ship, Tank (LST), visitors can look out onto a mural of Omaha Beach as detachments of Civil Engineer Corps (CEC) officers and Seabees handled the vitally important offloading of men and materiel and ponder the invasion on June 6, 1944. Visitors will join with the Seabees as they cross over into North Africa, Sicily, and the Italian mainland, watching combat footage of Seabees under fire. To introduce the new galleries, Lara Godbille, Ph.D., U.S. Navy Seabees Museum Director will present a lecture entitled “Seabees and Civil Engineer Corps Officers: Overlooked Heroes at the Invasion of Normandy” on June 5, 2014 from 7 – 8 p.m. at the museum. The lecture is open to the public and admission is free. “Under development since early 2013, the staff and I are extremely proud to share this story with the Seabee community and the general public,” said Godbille. “It’s important to remember the invasions of North Africa, the Mediterranean, and France would have been impossible had Seabees and CEC officers not perfected the use of pontoon causeways and construction of artificial harbors vital to keeping the fighting men ashore supplied,” she said. The California Department of Veterans Affairs (CalVet) today honored five Medal of Honor recipients whom received this recognition posthumously from President Barack Obama with a very special ceremony on the West Steps of the State Capitol. Honored and recognized on the occasion of their having received these long overdue Medals of Honor were Specialist Fourth Class Leonard L. Alvarado; Sergeant Jesus S. Duran; Sergeant First Class Eduardo C. Gomez; Private Joe Gandara and Private First Class Salvador J. Lara. More than 200 people gathered to witness the honors rendered to the families of these five Medal of Honor recipients. Also on hand to honor Alvarado, Duran, Gomez, Gandara and Lara were Captain James Taylor, U.S. Army (Ret) Medal of Honor Recipient; Brigadier General Sylvia R. Crockett, California Military Department; the Honorable Richard D. Roth, California State Senate; the Honorable Rocky Chavez, California State Assembly; and the Most Reverend Jaime Soto, Bishop of Sacramento. The California Military Department provided the appropriate music and Captain Sonya Moore, California Military Department lead the attendees in a heartfelt rendition of our National Anthem. Following the presentation of Senate/Assembly Joint Resolutions, letters from Governor Jerry Brown and Secretary Gravett and a California state flag, the family members of these valiant five Medal of Honor recipients were welcomed at CalVet headquarters for the unveiling of the names on CalVet’s Medal of Honor Wall. These five Californians, who served our country valiantly during WWII, the Korean War and War in Vietnam, originally received the Distinguished Service Cross, the nation’s second highest military award. In 2002, Congress, through the Defense Authorization Act, called for a review of Jewish American and Hispanic American veteran war records from WWII, the Korean War and the Vietnam War to ensure those deserving the Medal of Honor were not denied because of prejudice for being Jewish American and Hispanic American. This review discovered that the records of several soldiers displayed the criteria making them worthy of the Medal of Honor. •	Specialist Fourth Class Leonard L. Alvarado will receive the Medal of Honor posthumously for his courageous actions while serving as a Rifleman with Company D, 2d Battalion, 12th Cavalry, 1st Cavalry Division (Airmobile) during combat operations against an armed enemy in Phuoc Long Province, Republic of Vietnam, on Aug. 12, 1969. •	Sergeant Jesus S. Duran will receive the Medal of Honor posthumously for his courageous actions while serving as an acting M-60 machine gunner in Company E, 2d Battalion, 5th Cavalry, 1st Cavalry Division (Airmobile) during combat operations against an armed enemy in the Republic of Vietnam, on April 10, 1969. •	Sergeant First Class Eduardo C. Gomez will receive the Medal of Honor posthumously for his courageous actions while serving with Company I, 8th Cavalry Regiment, 1st Cavalry Division during combat operations against an armed enemy in Tabu-dong, Korea, on Sept. 3, 1950. •	Private Joe Gandara will receive the Medal of Honor posthumously for his courageous actions while serving with Company D, 2d Battalion, 507th Parachute Infantry Regiment, 17th Airborne Division during combat operations against an armed enemy in Amfreville, France, on June 9, 1944. •	Private First Class Salvador J. Lara will receive the Medal of Honor posthumously for his courageous actions while serving as the Squad Leader of a rifle squad with 2d Platoon, Company L, 180th Infantry, 45th Infantry Division during combat operations against an armed enemy in Aprilia, Italy, on May 27 and 28, 1944. Following the ceremony, family members and special guests were treated to a delicious lunch in CalVet’s Medal of Honor Hall sponsored by the California Veterans Benefit Fund. SACRAMENTO, CA — Governor Jerry Brown today made several appointments to leadership positions at the California Department of Veterans Affairs. Nancy Bien, of Camarillo, has been appointed skilled nursing facility administrator at the Veterans Home of California, West Los Angeles. Bien held multiple positions at the Los Angeles Jewish Home from 2008 to 2014, including administrator in training, residential care facility for the elderly administrator, assistant to the administrator and director of nursing. She was long-term consultant on Social Security Systems for the United Nations Development Programme in China from 1997 to 1999 and an independent consultant from 1993 to 2003. Julian Manalo, of Corona, has been appointed deputy administrator at the Veterans Home of California, West Los Angeles. Manalo has been a medical administrator and major in the California Air National Guard since 2008. He was a homeland response force observer, controller and trainer for the National Guard Bureau Joint Staff, Office of the Joint Surgeon in 2013, an operations and training officer in the California Air National Guard Homeland Response Force from 2010 to 2013 and residential care facility for the elderly administrator at the Village Homes of Moreno Valley from 2006 to 2012. Manalo served as a captain in the California Army National Guard from 1999 to 2008 and fire chief and emergency management coordinator at the California Department of Mental Health Patton State Hospital from 1995 to 2008. Paul Sullivan, of Cedar Park, Texas, has been appointed deputy secretary of communications at the California Department of Veterans Affairs. Sullivan has been managing director of public affairs and veterans outreach at Bergmann and Moore LLC since 2012. He was executive director at the National Organizations of Veterans' Advocates from 2011 to 2012, executive director at Veterans for Common Sense from 2006 to 2011 and lead program analyst in Veterans Benefits Administration at the U.S. Department of Veterans Affairs from 2000 to 2006. Sullivan was executive director at the National Gulf War Resource Center from 1997 to 2000, armored reconnaissance specialist in the Georgia Army National Guard from 1991 to 1993 and armored reconnaissance specialist in the U.S. Army from 1989 to 1991. He served in the 1st Armored Division of the U.S. Army during the Gulf War in 1991. JP Tremblay, who served as Deputy Secretary for Legislation and Communications prior to today’s appointment, will now serve as Deputy Secretary for Legislation and Government Relations. SACRAMENTO — As we prepare to honor the men and women who died protecting our freedom this Memorial Day, the California Department of Veterans Affairs (CalVet) and the California Association of County Veterans Service Officers (CACVSO) are launching the “If you served, you earned” campaign to help connect the state’s military veterans with the benefits and services they’ve earned. “Not all veterans are in crisis, homeless and in need of emergency help, but every veteran has earned benefits and services that can help them complete school or job training, buy a home, help send their kids to college, find a job, and much more,” said Mike McManus, Second Vice President of the CACVSO. Both McManus and Gravett noted that there are thousands of veterans living in California that have never even thought that they would qualify for veteran benefits because they didn’t serve overseas or see combat, they may not know that they are entitled to services and programs simply because they served in the U.S. Military. The objective of this informational campaign is to change that understanding and mindset. “Working with County Veterans Service Officers (CVSOs) around the state, we’ve established a toll-free number (1-844-SERV-VET) veterans can call to be connected to their nearest CVSO, and get information about the benefits and services they may be eligible to receive,” said CalVet Secretary Gravett. Benefits available to qualifying veterans include disability pensions; education and training; healthcare; home loans; rehabilitation and employment services; and various burial, death benefits and healthcare may be available to dependents and surviving family members of deceased veterans. “Anyone who served in the Army, Navy, Marines, Air Force or Reserves may be eligible for benefits, even if they did not see combat,” said McManus. In addition to the toll-free number, the campaign features TV, radio and print advertising, brochures, billboards, and other outreach materials aimed at veterans. Most of the materials are available at www.calvet.ca.gov. The CVSOs are also distributing information. To learn more, veterans and their families should call 1-844-SERV-VET (737-8838). Media interested in partnering with CalVet on TV or radio advertising are asked to call Kelli Reid at 916-447-8186. 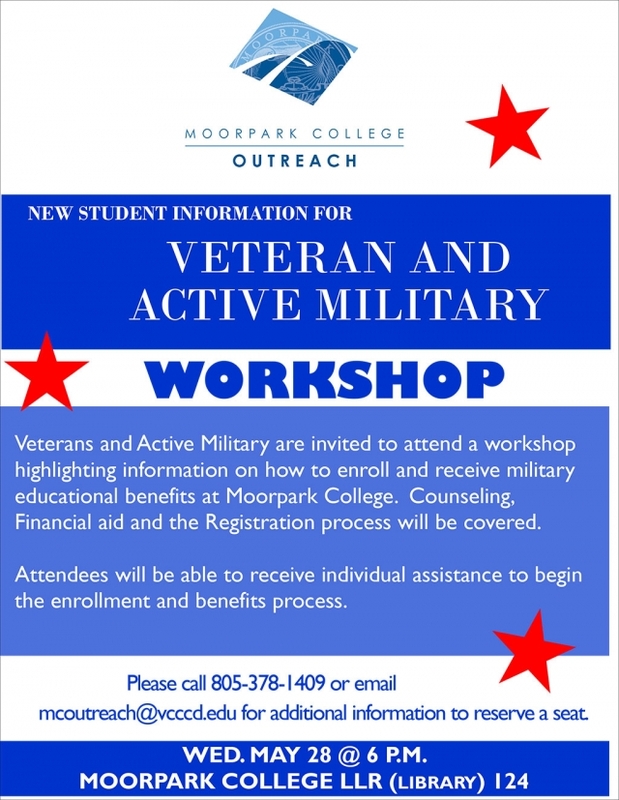 Veterans, Active Military, and Reservists are invited to attend a FREE workshop on Wednesday, May 28, 2014, highlighting information on how to enroll as a student and receive military educational benefits at Moorpark College. Discussion topics include counseling, financial aid, and registration. Attendees will have an opportunity to meet campus Student Veteran Club members and receive individual assistance to begin the enrollment and benefits process. The workshop will begin at 6 p.m. in the Moorpark College LLR (Library), Room 124, 7075 Campus Road, Moorpark, CA. Please call 805-378-1409 or email mcoutreach@vcccd.edu to reserve a seat. Free parking is available (Lot A or B recommended). SACRAMENTO, CA – Getting connected to veterans benefits and local services just got easier for California veterans thanks to the launch of CalVet’s newly designed and more intuitive web site and its myCalVet feature. The myCalVet tool turns the website user experience into a customized, interactive, intention-based encounter for each user. The new site, developed with the support of Assembly Speaker John Perez, serves as a portal through which veterans, family members and stakeholders can connect to all the veterans benefits and services available throughout the state. “The newly-designed website brings the department’s digital presence into the 21st Century,” Assembly Veterans Affairs Committee Chair Sharon Quirk-Silva said today as the new site was introduced at a Capitol news conference. “With this new website, veterans, their families and those who work with and for veterans have a new resource that will ensure a more smooth transition from military to civilian life,” said Peter J. Gravett, Secretary of the California Department of Veterans Affairs. The myCalVet tool allows website users to create a personal online profile based on their own interests and needs. Once a user logs in, the CalVet website browsing experience will be customized to their own profile and preferences. The myCalVet tool is GPS-enabled and will direct users to the healthcare, education, housing, employment, advocacy, claims assistance and other service providers nearest to them. The myCalVet functionality also enables federal, state and local database sharing, revealing more about California’s veterans and allowing CalVet to more easily interpret state and national statistical and demographic information. The system developed in partnership with the California Department of Technology lets CalVet know who our state’s veterans are, what they need, and where they live. It is the conduit for all things veteran in the State of California. California is currently home to nearly 1.8 million veterans, and another 30,000 are expected to return to the state every year. The new CalVet website and its myCalVet feature brings the Department’s digital presence into the 21st Century and enables CalVet to leverage technology to reach out to California’s growing number of veterans more cost effectively. The website will help veterans of every era connect with the impressive array of state and federal benefits that may be available to them and enable returning veterans and their families get the benefits and services they need to move successfully from military to civilian life. To view the new CalVet website or try out the myCalVet feature, go to www.calvet.ca.gov.